The best deer bullet I have ever used in my 1895. Accuracy with H322 is excellent. Never had one go over 50 yds and most were bang/flop. 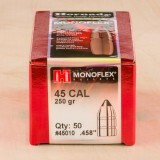 These Hornady projectiles are everything that you would expect from Hornady. But the real bonus is dealing with Widener's, this was the first of many purchases for me. Their service and response time is second to none. I received a confirmation of my order within minutes and the bullets arrives a day early. Well done Widener's...You've made me a customer for life. 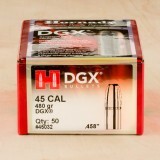 If you need an outstanding bullet for your .458 SOCOM cartridges, order this 50-round box from Hornady. 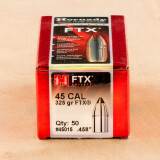 These sleek and expertly-designed 325-grain bullets deliver the maximum performance you expect while maintaining superior accuracy and consistency. 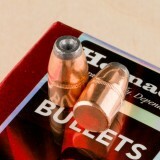 These .458-inch diameter bullets have a patented flex-tip design and an interlocking ring that mechanically-locks the core and the jacket together for excellent weight retention and deep penetration. 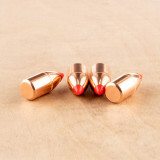 The secant ogive gives the bullets stability and flat trajectories, increasing the effectiveness of each and every shot. 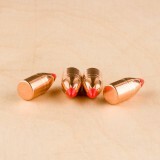 The bullets will cycle smoothly into the chamber and give off less fouling, helping you maintain superior accuracy. 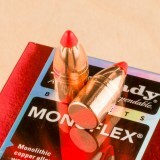 Hornady is one of the most popular and innovative bullet manufacturers in the country. 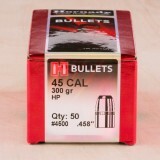 They have a large selection of top-quality bullets that deliver accuracy and precision to many different calibers. 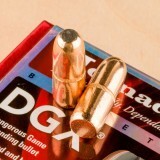 Since 1949, this Nebraska-based company has been a top name in ammunition and reloading supplies. Addition to my recent review. The factory load on this bullet is 1785 fps in my guide gun 18in they must use a 24in barrel to show 2200 fps on the box. 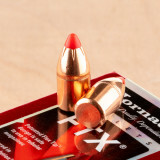 However I am getting the 2200 fps with the 42 grains of AA 1680. If you do not want to cut the cases then feed the bullet into your breach by hand followed by a 350 grain round nose which will cycle. The problem is the flex tip hitting the tube and failing to cycle. Cut your cases and they cycle just mine. 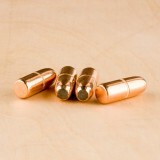 I am using these Bullets in a single shot Buffalo Classic, so I can run them a little longer than spec. I would not use the in my lever gun as I am sure they would jam. 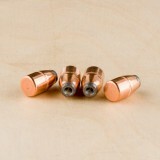 To load these bullets to 5.25" would mean a very deep set which could lead to a compression load. Not a good thing. Because the single shot is more forgiving it worked out. As far as shooting goes very accurate.